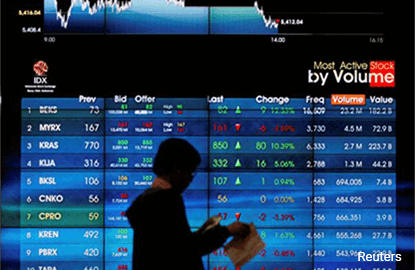 (March 20): Indonesian and Philippine shares fell on Monday as investors chose to book profit after recent gains, while Malaysia hit its highest in nearly 22 months on the back of gains in telecom stocks. The Jakarta Composite Index closed 0.1% lower following last week's record-setting spree with consumer and energy stocks leading the decline. Shares of tobacco maker Hanjaya Mandala Sampoerna Tbk PT fell 1.3%, while United Tractors Tbk PT dropped 3.4%. An index of the 45 most liquid stocks was down 0.7%. Philippine shares snapped two straight sessions of gains, dragged down by financial and consumer stocks. "The Philippine market weakened on account of profit-taking. Ayala Land and SM Prime fell prey to selling pressure and investors cashed in on gains," said Manny Cruz, an analyst with Manila-based Asiasec Equities Inc.
Property developer SM Prime Holdings Inc closed 1% lower, while Ayala Land Inc ended down 1.6%. Meanwhile, Malaysian shares closed higher for a third consecutive session, after rising as much as 0.6% to their highest in about 22 months. Telecom stocks led the gains with Axiata Group Bhd climbing 2.2%. Singapore shares ended slightly lower, snapping two sessions of gains, with financials and industrials leading the decline. The three big Singapore banks fell between 0.3% and 0.7%, while Singapore Technologies Engineering Ltd declined 1.9%.